Our month started off well with a long weekend in Stralsund and Rügen, where we celebrated Sebastian’s birthday. The weekend after, we hosted a party for all of his relatives, which was stressful but also a delicious success. We finally had more time to read in October, but unfortunately we spent most of it slogging through Assassin’s Apprentice for the #PlentyofHobb readalong. ? We also made it back to the movie theater for the first time since July! Although it wasn’t quite as much of a bookish story as we’d hoped, Midnight at the Bright Ideas Bookstore was still entertaining, and the second half was especially suspenseful – and also reminded us quite a lot of Riley Sager’s Final Girls. This was our first Agatha Christie novel, but it certainly won’t be our last! It was a fun, quick, addictive read – not at all what you’d expect from a novel written in the 1930s. The mystery kept us guessing until the very end, although Sebastian was a bit disappointed by the final resolution. This was a 5-star thriller that was addictive as hell, almost impossible to put down and dealt with a very interesting topic but only a 3-star Robert Langdon story that somehow forgot to make use of the strengths of the character and the series – meaning that there was surprisingly little puzzle-solving and code-cracking this time. Nonetheless we don’t think we’ll get tired of reading Dan Brown novels anytime soon! This book was great 75% of the way through, and then suddenly it was over, giving us the feeling that we’d skipped right past some major events in the story. Still, it was worth reading, and we’re happy to have checked it off our TBRs…two years later. ? This was our third listen to this German audio drama, and each time is just as fantastic as the last. There’s an English version now, so if you’re a fan of Stranger Things, we highly recommend you check out Monster 1983! Phew, this was a long one. 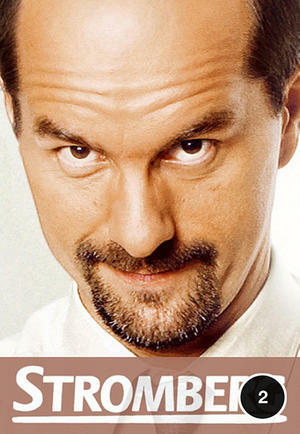 Novellas are always hit-or-miss for me, but this one was fortunately a hit. My biggest complaint, as always, is that it wasn’t long enough, but luckily there are two sequels to look forward to. Diverse science fiction for the win! Ania Ahlborn’s books come highly recommended by many bookstagrammers I follow, and October was the perfect time to finally read one. I didn’t love it as much as I’d hoped, but it was still an addictive horror novel with a spooky atmosphere. I especially liked the open ending. I loved Fowley-Doyle’s debut novel, but after seeing several unenthusiastic reviews, I went into her second novel with lowered expectations. It turns out I needn’t have worried, as I thought this book was just as good. Spellbook of the Lost and Found is magical realism at its best! The third book in the Expanse series, I found Abaddon’s Gate to be the weakest so far. Although I did get invested by the end, much of it dragged, and the religious plot line was completely uninteresting and unnecessary. The one thing this series really has going for it, though, is the diversity! I didn’t know it was possible for a book to hurt THIS MUCH. My heart broke over and over for Kiko. Her story is so real, and I had to keep reminding myself I was reading a work of fiction. I also related to Kiko in a lot of ways, which is always comforting to find in a book. I highly recommend this to everyone! I also recommend reading it with a buddy. I’m grateful that I had Cait to cry with. I love the idea behind this book, but ultimately it didn’t live up to my expectations. I really enjoyed the first couple short stories, but then my interest fizzled out as they all started to blend together. I’ve struggled with Catherynne M. Valente’s writing in the past, and the fantastic premise couldn’t quite make me look past it here. IT: This movie has been ridiculously hyped, and now we can confirm that it’s indeed as good as everyone says. It wasn’t scary, exactly, but the atmosphere was definitely creepy, and it made Maraia feel uncomfortable the entire time, never knowing when Pennywise might jump out. ? It’s hard to imagine that the adults‘ timeline can live up to the standards set by part 1, but we’re looking forward to it anyway. ATYPICAL: We started this on a whim while on vacation and were hooked in about five minutes. 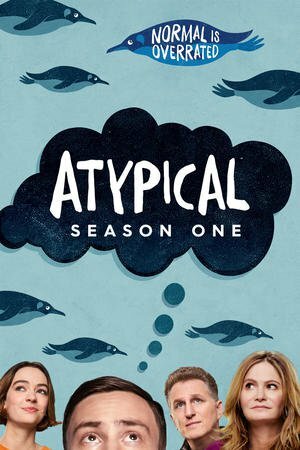 Although we’ve heard there are some issues with the representation of autism, we still loved this hilarious show. With a couple exceptions, the characters really grew on us, and we’ll be happy to see them again in the next season. 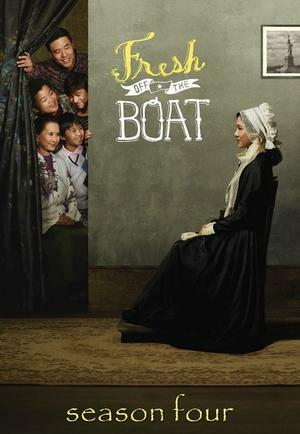 FRESH OFF THE BOAT: We finished season 3 and started season 4. It’s still funny, but the new season is a bit different than the previous ones. The Huangs are also making some very questionable decisions. ? 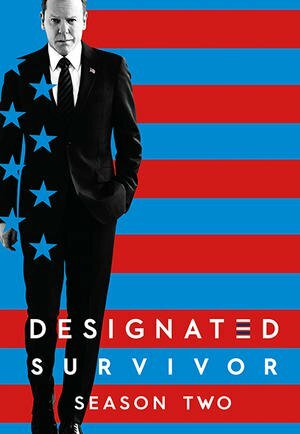 DESIGNATED SURVIVOR: Season 2 finally started, and although it’s not quite as new and exciting as season 1, we’re still enjoying it a lot. It’s just painful to watch what things could be like if we had a thoughtful and kind president leading the country, instead of what we actually have. ? 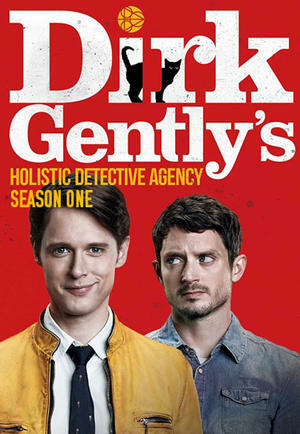 DIRK GENTLY’S HOLISTIC DETECTIVE AGENCY: We went into this with no expectations, knowing only that Frodo – er, Elijah Wood – is in it and that it’s based off of novels by Douglas Adams. It was SO WEIRD, but it was also hilarious, addictive, and a lot of fun. We’re looking forward to seeing what these bizarre characters get up to next. 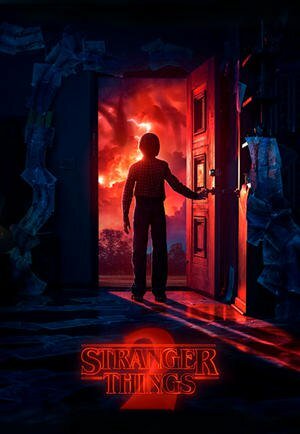 STRANGER THINGS: We of course had to re-watch season 1 in preparation for season 2, and it was even more amazing the second time around! The episodes of season 2 that we’ve seen so far have been just as great (except for that super annoying Eleven-only episode), and we already know we’ll be desperate for more when the too-short season is over. Did you celebrate Halloween and read any scary books or watch horror movies? Exactly, then you can hide behind your food and always have a full mouth. ? I’m still thinking about Starfish. Gaaah. Hahahaha, I actually love that! You really should read Spellbook of the Lost and Found! But Failure to Communicate first, okay? ? YOU get jealous of parties? ??? Haaaaa I feel so bad for not having read Assassin’s Quest yet!! 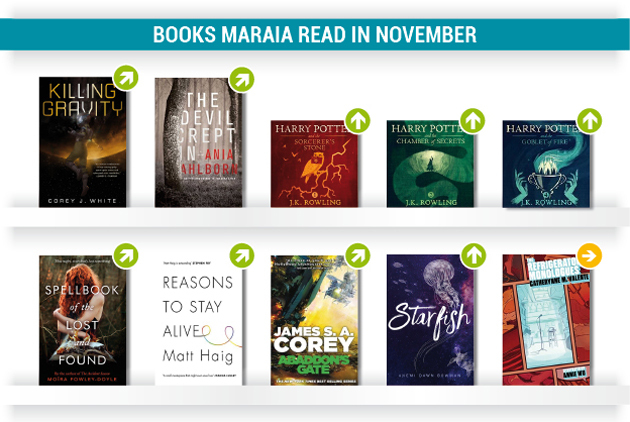 that will be a November or December read for me I guess! Oh I’m glad you liked Killing Gravity! I loved that one, can’t wait for the sequel!! Do you know when the sequel is coming out? I can’t wait for you to read Starfish! I’m curious to know what you think of Valente’s writing. I know a lot of people love it. I haven’t heard of that short story. I wonder if I’d like it any better, haha. I’m glad you survived your party! I always get stressed when I know a large amount of people will be coming to my house. I’m literally drained when they all leave. I didn’t realize you read Spellbook of the Lost and Found. I had that one on my must read list and, of course, I still haven’t read it lol. I’m iffy about magical realism, but I’ve had success with some. Matt asked to watch It on Halloween and I refused. I hate horror movies. I’m not exaggerating when I say I wouldn’t sleep for weeks lol. Nooo, we could have buddy read it! That’s so disappointing. I hope you like it. Haha, it really was a good movie, but I’m pretty sure it would have terrified you. I’ve hear nothing but fantastic things about Starfish. I must read it soon, but also remember to prepare myself emotionally. Have a wonderful November! I really want to watch and read Dirk Gently. It sounds really interesting! Ooh, sounds like a good month for you both! I’m glad you enjoyed It – I’m currently fighting with myself, because I bought the book with the intention of reading it before the movie came out and then watching the movie, but the book is 1000 pages or something like that, and there’s no way I’m going to beat my Goodreads reading challenge goal with that chunk taking up a lot of my time! Haha! Also, you reminded me I need to catch up with Dirk Gently! I watched about 5 episodes, then got distracted by something, but I was really enjoying it! And totally yes to Stranger Things 2! (Spoilers ahead just in case anyone’s reading this comment and hasn’t watched the new season yet!) Bob = </3! It was made worse by the fact that he's Samwise :'( I'm wondering if they're going to make Eight more prominent in season 3, or if she was just a plot device to show how Eleven became strong enough to close the gate. Did you notice Eleven's blue hair band in the dance scene by the way? I read something about it and it gave me the feels!! Are you talking about It? In some ways I’m tempted to say you can go ahead and watch the movie even without having read the book. I did really like the book, except for one scene that kind of ruined it for me. Fortunately, it’s not in the movie. Haha, you don’t have that many episodes left, then! That was so sad! We both saw it coming, and I ship her with Hopper, but STILL.